Edit and save the class list on the Generator page. Firstly please note that this page will only work if you have saved your class list on the main Random Student Generator page. 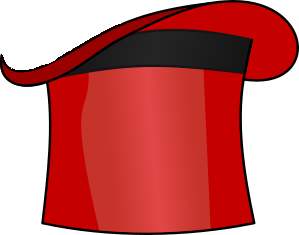 When that has been done a button will appear on the red top hat labelled 'PICK'. This is the button you use to pick a name at random out of the hat. Each time the button is clicked another name will be pulled out of the hat and posted on the notice board. When there are no names left in the hat the Pick button will change to 'SHUFFLE' and can be used to start the process again with all the names being placed back into the hat. The difference between this page and the Random Student Generator is that each name can only be picked once from the hat but the generator picks names at random regardless of whether they have been picked before. Go back to the main Student Random Generator page for links to pages that will arrange the class into random groups, manually arranged groups or groups determined by number patterns.